There is simply no better way to enjoy the beauty of the Sisters Country than to lace up your boots and hit the trail. Hiking opportunities abound, from easy strolls to back country adventures. Sisters Country holds some of the finest fishing stock in the nation. From the big waters of the Lower Deschutes River tailwater and the cold and crystal clear Metolius River, to the numerous other creeks and mountain lakes, Sisters has gained a national reputation. Endless dirt roads, ever increasing miles of single-track trails, and easy access to the wilderness combine to make Sisters Country a veritable runner's paradise. Sisters is a golfing mecca with unmatched mountain scenery. From the championship-caliber courses of the area it is possible to view snowcapped mountains and hear the strains of high country breezes play in the trees. The Sisters area is one of the premier mountain biking regions in the state. The best known and most popular trails include the Peterson Ridge Trail System with its trailhead within the city limits, the Suttle Tie Trail between Black Butte and Suttle Lake, and the nearby McKenzie River Trail, which is widely regarded as one of the great epic bike trails in North America. Take a tour of rural backroads. Dig in for a heart-pounding mountain climb. The Sisters Country offers something for every cyclist, from weekend warriors to elite riders. Sisters Trails Alliance works closely with many partners to support equestrian, hiking, and mountain biking. If you have an itch to get your feet wet while enjoying a thrilling ride through some spectacular country, head out to raft one of Central Oregon's wild rivers. The old-fashioned way of hitting the trail is one of the best ways to enjoy Sisters Country. You'll enjoy some of the best horseback riding country to be found anywhere in the American West. Whether your pleasure is blasting down the slopes on skis or trekking through the forests on cross-country skis or snowshoes, Sisters Country will fulfill all your desires for winter adventure. 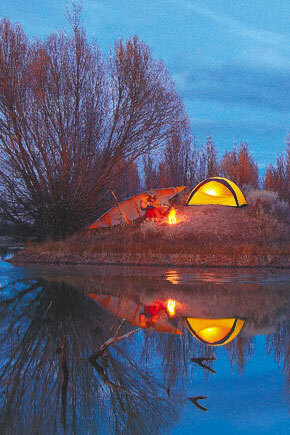 Sisters and Camp Sherman offer some of the nicest camping experiences to be found in Oregon. Spend the night under the stars amidst the whispering pines and wake up to go hiking and fishing in some of the prettiest country around. Spectacular views, modern amenities and lots of activities make a resort stay a great option for families. Camp Sherman has been a jewel in the crown of the Pacific Northwest since native peoples first pitched camp along the banks of the Metolius River. The name Metolius translates roughly to "River of the White Salmon," a reference to spring spawning Chinook. Are you looking for a taste of Alpine magnificence? No need to travel to the Alps! Wonderful wildflowers run riot in forests and meadows. Osprey diving for food in beautiful Suttle Lake. Hawks soaring on the wind above the sprawling green hay fields. Woodpeckers at work in the forests of Camp Sherman. It's a birder's paradise in Sisters Country. You're here to relax, de-stress and get away from it all, right? What better way to do that than spending a day at the spa? And does Sisters ever offer a palette of delight. A little culture and a lot of fun just a few miles away. A few hours down the road lie the treasures of the Oregon outback. Many folks come to Sisters to relax and get away from it all. Some show up and pitch in on community events. © Copyright 2018 The Nugget Newspaper, LLC. All rights reserved.